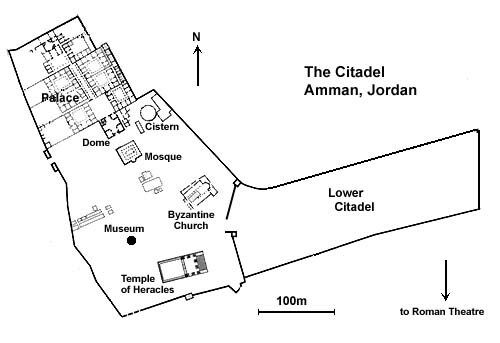 The Hill of the Citadel (Jabal al-Qal'a) in the middle of Amman was occupied as early as the Neolithic period, and fortified during the Bronze Age (1800 BC). The ruins on the hill today are Roman through early Islamic. The name "Amman" comes from "Rabbath Ammon," or "Great City of the Ammonites," who settled in the region some time after 1200 BC. The Bible records that King David captured the city in the early 10th century BC; Uriah the Hittite, husband of King David's paramour Bathsheba, was killed here after the king ordered him to the front line of battle. In ancient times, Amman with its surrounding region was successively ruled by the then-superpowers of the Middle East: Assyria (8th century BC), Babylonia (6th century), the Ptolemies, the Seleucids (third century BC), Rome (1st century BC), and the Umayyads (7th century AD). Renamed "Philadelphia" after himself by Ptolemy II Philadelphus, the city was incorporated into Pompey the Great's province of Syria, and later into the province of Arabia created by Trajan (106 AD). As the southernmost city of the Decapolis, Philadelphia prospered during Imperial times due to its advantageous location alongside Trajan's new trade and administrative road, the Via Nova Traiana. When Transjordan passed into Arab rule in the 7th century AD, its Umayyad rulers restored the city's original name of Amman. Neglected under the Abbasids and abandoned by the Mamlukes, the city's fortunes did not revive until the late 19th century, under the Ottoman empire. Amman became the capital of the Emirate of Transjordan in 1921, and of the newly-created Hashemite Kingdom of Jordan in 1947. Greater Amman (the core city plus suburbs) today remains by far the most important urban area in Jordan, containing over half of the country's population or about 3 million out of 5 million people.